In the days before Panorama broadcast on March 31, Lutfur Rahman and his camp looked into their crystal ball and confidently warned the world the programme would be “racist” and “Islamophobic”. You may be aware that BBC Panorama is due to air a programme about Tower Hamlets next week. I believe the programme is being used for political campaigning and electioneering purposes just weeks before local and Mayoral elections in May. A dossier passed to us by a BBC whistle-blower has revealed it to be in total breach of the BBC’s editorial guidelines as a public broadcaster. It has clear racist and Islamophobic overtones targeting the Bangladeshi Muslim community in Tower Hamlets. The BBC and the undercover production company, Films of Record, have also been referred to the Information Commissioner and there is now a criminal investigation underway. He was referring, of course, to the so-called “whistleblower” who was hired by the Panorama team to work as a journalist/researcher. I wrote about her here. She lasted four days before the team waved her goodbye. She took a very important dossier she’d “obtained” from the Panorama team and handed it to the Mayor’s office. She then claimed “whistleblower” status. 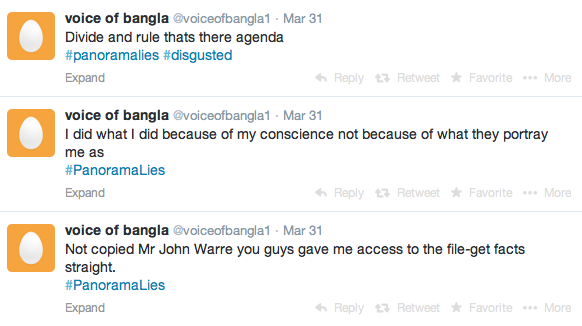 She claimed the programme was biased and that she’d witnessed racism among the producers and reporting team. This was all gleefully exploited by Lutfur and his aides as yet more evidence of an Establishment stitch-up. He even wrote to the BBC’s Director General to demand the programme be pulled, he told us on his blog. The so-called “whistleblower” herself started a blog and opened an anonymous Twitter account where she detailed her experiences. As some of you are aware there is a criminal investigation under way relating to this programme which limits me as to what I can disclose. Well, allow me to disclose something. Today, I asked the Information Commissioner’s Office (ICO) whether there was, as Lutfur said, a criminal investigation into the BBC. No, they confirmed. And neither is there one into Films of Record, the production company. I asked whether there was any criminal investigation, but all they would say is there is an “investigation into allegations of a breach of the Data Protection Act and enquiries are continuing”. However, I can go further. I gather that a member of the public, who has for many years been a close observer of Tower Hamlets politics, has made his own complaint to the ICO because data connected to him was in the dossier. I understand from him that the there IS a criminal investigation and that he’s a witness. Not only that, I gather from him that the ICO also has an official “suspect” in the case. Yes, the so-called “whistleblower” herself. She’s the one being investigated, not the BBC. Wonder if Lutfur will tweet that? Well, I don’t think any reasonable person thinks that. Even the Guardian’s Dave Hill, who takes a more measured tone than most on these issues (to the point of glossing over Lutfur’s character sometimes) said, “the Panorama show was pretty measured, sketched in relevant context and acknowledged some of the borough’s achievements. The questions it asked were reasonable. It didn’t recycle that pernicious glory-seeking back catalogue of Tower Hamlets’ Islamist conspiracy that so excites the far Right, and well done for that”. However, stand by for more phoney allegations of “racism” and “Islamophobia” – those last refuges of a bankrupt politician with no credible answers to the “reasonable” questions Panorama raised about his high handed and unaccountable governance. He’s been the victim himself of pretty nasty smears and innuendo. Quite rightly, he’s railed against the bigots who spread them. What a shame he’s resorting to similar tactics.